Top power development and fully variable speed for hard materials and increased material thicknesses. Ergonomic working because of the side stop that can be shifted by 30 degree. Tool-free copying ring and base-runner change. 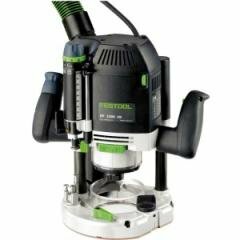 Fast, convenient router-bit change with rocker and ratchet principle. Detachable base plate for fast profile cutter adjustment. Dual guide column clamp for extra torsional rigidity and greater precision. Simple and exact routing depth setting to 1/10 mm. Dust extraction of up to 99 % during edge routing through adjustable extraction ring and chip catcher. Main applications Rabbeting, grooving and profiling. Routing large cutouts, circles and arcs with the MFS routing template. Creating worktop corner joints with the worktop template. Routing seals and espagnolettes in windows and doors. Stationary routing of up to 60 mm with the TF 2200 table router . Scope of delivery 12 mm clamping collet. 8 mm clamping collet. copying ring 30 mm. chip deflector. operation tool. in a SYSTAINER SYS 4 T-LOC.